Hegel emerges in human history and culture, the gradual genesis of the Absolute, which has, in itself, its foundation. The universal idea, the superior form of the Spirit, is at the end of the process, the absolute term. Hegel’s philosophy must embrace everything, to understand reality in its totality, think history and things, “Insight and understanding what is”. This is the task assigned to philosophy. Philosophy is a system that is to say an organized and closed all of whose elements are independent, knowledge and forming a unity embracing all elements of thought and life. This project to totalize and synthetize basic content for the idea, understood not as a subjective representation, but as spiritual principle dynamic, eternal creation, eternal life, rolling in its waters sparkling, all finite things determined. The essence of this idea which is formed, deepens and grows at different levels. It exists primarily as thought identical with itself (first moment). Then it goes out of itself and externalized (second time). Finally, during the third time, the Idea returns to itself and as Spirit unfolds, that is to say as Thought is gradually clarifying and reaching finally to the Absolute. – Logic, Science and the Idea of ​​logical categories, Philosophy of Nature, the science of the Idea of ​​Nature in developing external and the Philosophy of Spirit, student discipline, the return of the idea to her itself, from its external existence, correspond to the three spiritual moments. Consider, first, the logic and the laws of dialectics. The idea spreads, indeed dialectically, according to some determinations and laws as the analysis Hegel in the Logic. The fundamental principle of Hegel is the idea of ​​a deployment and a dialectical progression. That means, in this thinker, dialectics? – It’s overrun by successive contradictions (this term refers to passing precisely, Hegel, the act of removing and retaining deny, destroy sana) that takes place, in fact, the movement of all become . – At each step, a determination is denied and, at the same time preserved. – Thus, the button disappear in the collapse of the bloom: Flower denies the button and at the same time, keeps it. – Also is it the appearance of the fruit, and conservation negation of the flower. Such is the march in which each term is denied, at the same time, integrated. – Occurs as a uniting and unifying synthesis of antithetical moments. – In this development, a major role is played by contradiction, that is to say the set of terms which one is the negation of the other: and “death” and “alive” are they not not in isolation but in continuous exchange with each other. – Similarly, “being” and “nil”, “hot” and “cold”, such contradictory terms they called each other. In this perspective, the negative plays, of course, essential. – The negative is to say the timing of the development process where affirmative determinations are removed, embodies a true creative “work”. – It destroys, maintains and preserves, a single movement. Negative moment and positive moment are two sides of the Hegelian dialectic. The negative is the man who makes us understand. The man is, indeed, fundamentally, a desire denier: it tends toward a goal or object and it tries to assimilate, to deny them, as their own (for example, food is absorbed by the subject ). Only shows Hegel, desire is the desire of my generator. In a fight to the death for pure prestige, human consciousness confronts another consciousness and tries to be “recognize” in his superiority. Beyond the training of the individual self is in Work and into history as the negation is expressed with full power edifying. – Work is, in effect, denying nature to overcome is to build tools to refer the world outside the human form. – Thus, the man he humanizes things and he tames nature. – It has a practical activity, which refers to a transformation of external things, marked, therefore, the seal of human interiority and negativity. History, too (understood as the development of the Idea and spiritual process total), fully reveals man who is part of negativity in it: it is becoming where the man denies the world and externalizing and freedom. – Nevertheless, do not misunderstand the nature of historical development. – Certainly, an individual mark in history things his own project, but it is only the charge d’affaires of the World Spirit. – Indeed, history, spiritual movement which is engendered by the total absolute Idea, is a manifestation of reason, conceived as divine principle immanent in the world. – Reason governs things, and for the successful completion of his designs, she uses wishes, and passions of individuals. The men are they really what they want? – Actually, Reason “trick”: we just call it “cunning of reason” that it does not act by itself, but allowed to act in its place the human passions. – As men they wear and they are running out to update a project that goes far beyond that of “Reason” divine. In the eyes of Hegel, the historical process is, through these “tricks” variety, with intelligibility and transparency increasingly perfect. – In particular, the state is a realization of absolute reason. Far from designating an organization relative and contingent, it is the social substance came to full consciousness of itself. – In him, the man asserts and finds himself: far from being delivered to the arbitrary, he experimented in the state organization, an authentic self. History does not, in Hegel, a narrow sense, but it means a comprehensive and universal. The Universal History is nothing but the manifestation of the divine process of absolute Spirit, the gradual progress by which it becomes aware of itself. The final stages of total spiritual process correspond to those of Art, Religion and Philosophy: the movement of the Spirit acquires a transparency of greater and greater. – Art, in fact manifest the Absolute in a tangible form. – It means taking aim Spirit, speaking through a form or a concrete representation. – As for Beauty, it is defined, in this perspective, as the sensible manifestation of the Idea. The idea, conceived as a higher form of the Spirit, fully actualized in the artwork and the Beautiful. – However, it is still in the works of art, a form sensitive and does not yet reach the pure concept, as it will in philosophy. – This decline makes possible the coming of the Aesthetic, philosophical reflection on Art and Philosophy of Fine Arts. In Religion (training where the individual stands at the thought of God and in union with him), and Philosophy (Intelligence and thought of this and the real, system design and what is conceptual grasp of the world in his unit), the Spirit progressively divest himself of its matrix material. Thus the Absolute Spirit, freed from its merits, it reached full equality with himself. – It means the idea came to transparency, its being for-itself and knowledge of self, through the mediation of the final Art, Religion and the Philosophy. Our time is particularly severe in relation to Hegel. 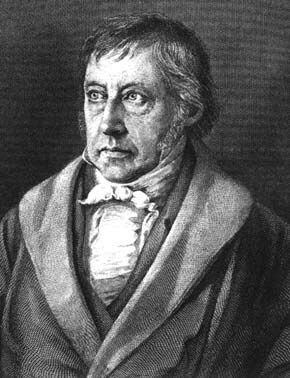 In the eyes of Hegel, all that has happened marks, indeed, a step toward the realization of the Spirit. Any historical phenomenon can be found in this context, its full legitimacy, as it is called by the same requirement of Reason. If rationalism is not always full satisfaction of our culture, the teachings of the Hegelian dialectic are by no means obsolete. Negativity, work the contradiction, as many rich Hegelian elements that must be taken into account and remaining analytical instruments.